The No. 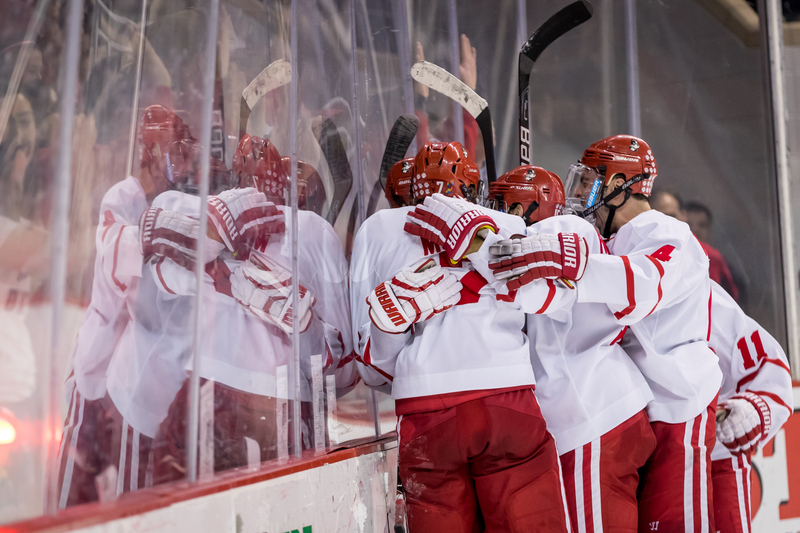 15 Boston University men’s hockey team went into the weekend looking for four Hockey East conference points and emerged with two. On Friday night, the Terriers looked to bounce back from their 3-0 loss to No. 8 Providence College. After a scoreless two periods, sophomore defenseman Chad Krys broke through the Friars’ defense and scored his first two goals of the season within 1:37 of the other. Sophomore goaltender Jake Oettinger’s 31-save night also contributed to the 2-0 win and marked his fifth collegiate shutout. However, BU was unable to carry this momentum into the following night as it hosted No. 13 Northeastern University. Forwards Bobby Hampton and Nolan Stevens got the Huskies on the board twice during the opening frame in what appeared to mimic last season’s Hockey East quarterfinals to a tee. Unlike like the quarterfinals, the Terriers were unable to come back despite junior forward Jordan Greenway’s second goal of the season. Stevens went on to score twice more in the second period to bring Northeastern home a 4-1 win while BU accumulated two game misconducts in the final period. While the Terriers were unable to match the Huskies’ offense, they will have another chance next Friday night at Matthews arena. Then the following night BU will host the University of No. 9 New Hampshire at Agganis Arena. Former Boston University men’s hockey forward Johnny McDermott is taking his talents to Hockey East rival Providence College, the sophomore announced Wednesday night via Twitter. After receiving playing time in 14 games of his first season with the Terriers, McDermott was stuck behind a loaded freshman class of forwards on the depth chart this year and was unable to break onto the ice. The Darien, Connecticut native took seven shots as a freshman, including two each against Union College and the University of Massachusetts-Lowell. While he did not score a goal during his BU tenure, he recorded an assist in his first collegiate action. In a 6-1 win over Colgate University last season on Oct. 8, McDermott combined with current sophomore forward Gabriel Chabot (who has also struggled to find ice time this season) to set up former forward Tommy Kelley on a goal to give the Terriers a 4-0 lead in the game. McDermott joins a Friars program that handed BU a disappointing 3-0 loss in Rhode Island on Saturday night and will take on BU this Friday night at Agganis Arena. The No. 6 Boston University men’s hockey team fell to both of its opponents, the No. 1 University of Denver and No. 11 Providence College, over the weekend. 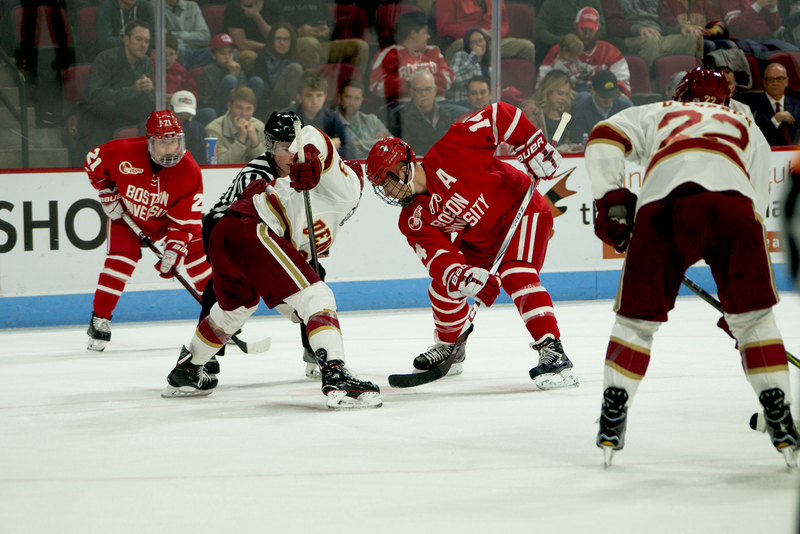 On Friday at Agganis Arena, Denver proved its dominance early with two tallies in the first four minutes of the game. Freshman forward Ty Amonte’s first goal of the season and another power-play goal from junior forward and assistant captain Bobo Carpenter in the same period tied the score. However, another strike late in the 1st period from Pioneers forward Colin Staub gave them a 3-2 lead Denver would keep until sophomore defenseman Dante Fabbro evened the score more than halfway through the final period. As the game appeared like it would go into overtime, Pioneers forward Troy Terry squashed those quells by finding the back of the net with 16.1 seconds remaining. The following night, the Terriers were unable to match Providence’s pace and physicality for the 60-minute matchup, but kept the Friars off the board in the first frame and neither players from each team were sent to the penalty box. Much of this changed in the second period, as Providence got on the board three times and BU’s performance began to decrease as they searched for a goal. Quinn said, in the post-game press conference after the Terriers’ loss to the Friars, that his young team was likely still feeling the previous night’s defeat and carried it into the following matchup. Although, BU has a chance to redeem itself as it hosts Providence again next Friday at Agganis and will see its crosstown competitor No. 20 Northeastern University there the following night. After a tough 4-3 loss to the No. 1 University of Denver last night at Agganis Arena, the No. 6 Boston University men’s hockey team will take on No. 11 Providence College at 7 p.m. at Schneider Arena for another Hockey East matchup. Read our preview here to see who to look out for during this game and follow along on our live blog. The Boston University men’s hockey team snagged three of a possible four points against Providence College this past weekend. Friday night’s clash was a 2-1 win at Schneider Arena, while Saturday’s game unfolded as a 2-2 overtime tie. From the good, the bad and the ugly, we offer several takes on what unfolded. As a bit of foreshadowing, it wasn’t the prettiest weekend of Terrier hockey, even if the results were largely favorable. David Quinn and Nate Leaman, the head coaches of Boston University and Providence College, respectively, both described clashes between their squads as a rivalry. After this past weekend’s series, it’s easy to understand why. Inside the hostile confines of Schneider Arena on Friday night, the Terriers snagged a 2-1 win, even if it was against the odds. Freshman goaltender Jake Oettinger put up nearly 40 saves, while the penalty kill was immense, especially in the first period. Another key storyline from Friday’s encounter was that BU’s depth was on full display. For various reasons, Nick Roberto, Jordan Greenway, Clayton Keller and Tommy Kelley were out, causing Quinn’s side to dig deep into the roster. For more on Nick’s recap, click here. For Jonathan’s sider, click here. The sides were right back at it again on Saturday night, this time at Agganis Arena. Despite being largely outplayed for the whole contest, BU snagged a 2-2 draw that carried through overtime. Such a close state of affairs wasn’t indicative of ineptness on BU’s part, though. The Terriers took 20 minutes of penalties, only for goals from Brandon Hickey and Nik Olsson to save their bacon. It wasn’t the prettiest game by any means, but three out a four possible points in Hockey East play is largely a success. For Jonathan’s recap, click here. For Nick’s sider on Olsson, click here. The Terriers and Friars are back at it again. One night removed from BU securing a 2-1 win over Providence College, the two sides meet again on Saturday evening at Agganis Arena. Puck drop is set for 7:05 p.m., and a free live stream is available by clicking here. Be sure to follow along on our live blog below, too! The Boston University men’s hockey team returns to action this weekend against Providence College. The first tilt is set for Friday night in Rhode Island’s capital city, while the Friars and Terriers return to Agganis Arena on Saturday night. We sat down with head coach David Quinn ahead of the series to preview all that’s in store. For updates on injuries, how BU spent its Thanksgiving break and more, click here. Hint: Quinn views this as a vital weekend set.